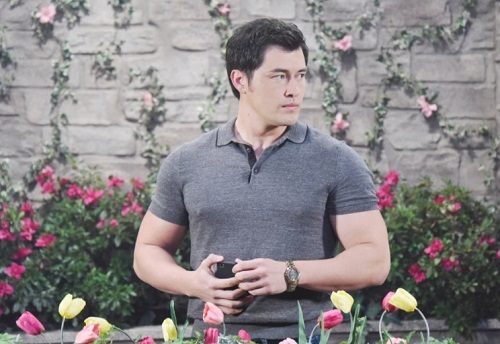 Days of Our Lives (DOOL) spoilers for Tuesday, April 17, tease that Paul (Christopher Sean) will worry about Sonny’s (Freddie Smith) involvement with Leo (Greg Rikaart). He recently spotted Vivian (Louise Sorel) having a conversation with Sonny’s latest love interest, so he’s naturally wondering what they’re up to. Whenever Vivian’s around, you can guarantee she’s stirring up trouble! Paul will consider filling Sonny in, but he’ll feel like he needs a little more info first. He knows things are still tense between them, so it’s wise not to jump the gun here. Instead, Paul will turn to Will (Chandler Massey) for advice. He’ll explain what he saw and try to figure out his next move. Days spoilers say Paul will confront Leo later this week, so we’ll see if he can rattle Leo’s cage. Meanwhile, Chloe (Nadia Bjorlin) and Kate (Lauren Koslow) will have a heated argument. It seems likely that Lucas (Bryan Dattilo) will be at the center of it. DOOL fans know Kate isn’t thrilled about Lucas’ interest in Chloe. She’s very much against their reunion, but Chloe will stand up to her enemy. It’s Lucas’ love life, so he can date anybody he wants. Kate obviously shouldn’t have a say in it. Elsewhere, Lucas will get into an argument of his own. Days spoilers state that he’ll disagree with Eve’s (Kassie DePaiva) opinion, so this is probably about Miguel’s (Philip Anthony-Rodriguez) proposal. Chloe’s considering an offer from Miguel’s boss, but it’s a bit shady. She has the chance to star in an opera in Mexico City, but she has no clue who this super fan is. Although Lucas wants Chloe to pass, Eve urged her to take advantage of this opportunity. It’s clear that Eve and Lucas aren’t on the same page. Lucas will blast Eve for pushing Chloe toward a dangerous situation, but she’ll probably argue that he’s holding Chloe back. Days of Our Lives spoilers say it’s doubtful they’ll change each other’s mind on this. Later, Eve will join Brady (Eric Martsolf), Ciara (Victoria Konefal) and Claire (Olivia Rose Keegan) as they await the contest results. The New Face of Bella competition is winding down, so everyone’s anxious to see the winner. DOOL spoilers reveal that Claire will emerge victorious, but only because of her scheming! These rigged results are sure to cause plenty of drama. We’ll give you updates as other Days of Our Lives news comes in. Stay tuned to the NBC soap and don’t forget to check CDL often for the latest Days of Our Lives spoilers, updates and news.